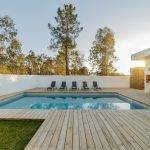 This following step-by-step article will help you transform your pool from Biguanide (Baquacil, SoftSwim hereafter referred to as Baqua) to chlorine. There are a few main advantages of keeping a chlorine pool instead of a Baqua pool. First, keeping a Baqua pool is expensive. Just the maintenance products will cost much more per month than using bleach, or even other ‘pool store’ forms of chlorine. Next, you may be able to run a Baqua pool successfully for a couple or even several seasons, but there will come a time when you will run into problems – cloudy water, pink slime, etc. 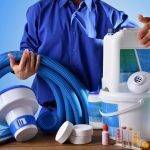 The pool store would have you drain your water (or partly drain it), change your filter media, and toss in stronger Baqua products. With proper testing and application of chlorine, you will be able to maintain your sparkling clean water without EVER SLAMing (or shocking) or draining! First, you will need a good test kit. Read Test Kits Compared. Next, familiarize yourself with PoolMath. These are invaluable tools that you will use during and after your conversion. To do the actual conversion, you will need a lot of liquid chlorine or bleach. See this page How to Chlorinate Your Pool for more info. The amount it will take depends on the size of your pool and how much Baqua residual you have in your pool. You will also need replacement media for your filter handy (sand, cartridges, DE) as you will need to clean your filter and change out the media AFTER your conversion is complete. Test your pH. You will want to adjust that to 7.2 – 7.4 before you begin. Use PoolMath to determine how much bleach you will need to raise your FC (Free Chlorine) from 0 to 15ppm. Add the bleach and watch the pretty colors! Take photos! Test your water frequently and add the appropriate amount of bleach to get back up to 15ppm. Do this as often as possible, as often as every hour if you can, but at least once a day. Make sure you test and add bleach before bed, and test again in the morning before the sun hits your pool. Initially, the FC will be used up very quickly. The more often you can test and boost your FC to 15, the faster the conversion will go. Toward the middle of the conversion, it is more prudent to test and add your bleach in the evening, or at other times when the sunlight is not directly shining on your water. Check the pressure in your filter frequently, and backwash (or clean cartridges) as necessary. You will flush out a ton of ‘Baqua-goo’. Brushing and/or vacuuming is helpful. When you lose 1 ppm of chlorine, or less, overnight it is time to clean out your filter and change the media. Once the filter is cleaned up, add enough CYA to reach 30 ppm. Continue to maintain FC at 15 ppm. Your conversion is complete when CC’s are 0.5 or less two days in a row. You are now ready to review Recommended Levels and ABCs of Pool Water Chemistry and begin balancing your water. If you have baqua products you did not use, see if you can return them for some CYA (Cyanuric Acid – aka conditioner or stabilizer) skimmer socks, or even store credit. You will need to go to the pool store occasionally! There are several conversion stories and testimonies in the “Baquacil – Use and Conversion” forum. Review these, as they cover many of the basic questions folks have when converting, and feel free to post any other questions you might have. Someone will be along shortly to help you out! We have never heard of a single person who converted and regretted it later! You will save money, be able to swim more, and be assured that you have a sparkling, sanitary, Trouble Free Pool!